Well not sure about all of you, but I am definitely heading off on holiday in the morning, for two weeks sun and relaxation in Mexico. Anyone who has had a conversation with me in past few weeks may have realised just how excited I am to be getting away from it all, and getting some much needed sun on me. For those that know Mexico, I'm flying into Cancun and will be staying a 5 Star All Inclusive hotel in Playa del Carmen called the Grand Riviera Princess, which is part of the Princess group. If you think you can avoid feeling jealous than have a google of the hotel, as it looks absolutely stunning, and I'll try my hardest to take as many photos as I can! My plans for the next two weeks involve sunbathing, sleeping in the sun, reading, swimming in some of the 8 pools in the hotel, enjoying my all inclusive package to the fullest, enjoying the evening entertainment, and hopefully hitting up the sun too. I am not really intending to see much or any of Mexico itself, so sorry if you are hoping I'll come back with great adventures, I just want to chill for two weeks! 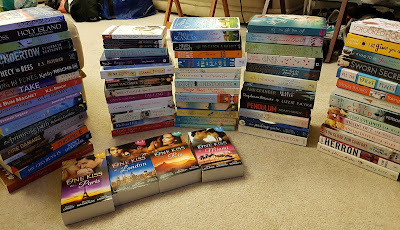 So I had to turn those stacks of books (and I didn't even take a photo of my review paperbacks!) into a more manageable amount to take on holiday with me. After of course asking twitter, which given I didn't have a random vote this week, I thought I'd still ask for a bit of input given my inability to make simple decisions, I finally came up with this stack of paperbacks to go with me. In the end I have gone with a selection of books all by authors I have read a lot of before (apart from The Singles Game by Lauren Weisberger - which should have been in my Booklympics books but I randomly chose not to read it after buying it specially!). Whether I have picked the right books I have no idea but I also have a kindle with me, and I purposely opted out of taking anything that looked emotional (don't want to end up in tear around a pool, that could be awkward), heavy (I have a weight allowance for the flights!) and decided not to risk my thrillers for this, as I have plenty in e-book if I need to scare myself! While I am away there are two posts going live including one with a giveaway and preview for my Cute Christmas event starting the weekend that I'm back, so please do check it out. I'll be back on social media jet lagged on the 13th December so will see you all then in the run up to Christmas! And out of pure curiosity, would you have picked the same books, anything different? Very interested as other books could get bumped up my piles to be read eventually if I know what's good! This Christmas pantomime is about to be the talk of the town! Luna Bay’s festive preparations are well under way and the much anticipated annual pantomime is to be, once again, the highlight of the season. Too bad that the village’s very own actress and darling of Broadway, Alice Woods, isn’t feeling in the mood for Christmas. So with (more than) a little help from her new found friends, not to mention one very gorgeous Hollywood A-list celebrity, the play begins to come together, but will Alice finally believe that Christmas is a time for miracles after all? What an enchanting and heart warming story to lead you up to the Christmas period this year. I am loving the Luna Bay series of books, and this one definitely kept me interested in the story, and had me smiling quite a lot. 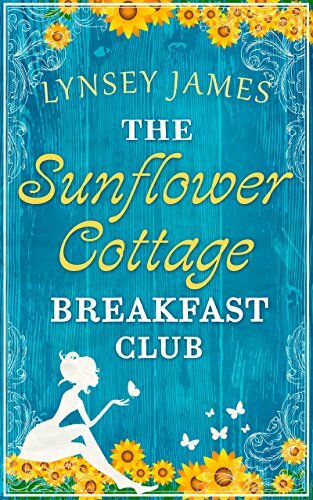 If you read The Sunflower Cottage Breakfast Club, you will already be slightly familiar with the character of Alice Woods. If you haven't don't worry this is a fully standalone book, although there are plenty of familiar faces to be seen too. Alice moved back to Luna Bay a few years ago, after the death of her beloved Jamie, and in doing so has cut herself off from the world, and also has sworn never to go back to the theatre. However three years on, she is starting to try to piece together a new life which sees her out and about a bit more. I loved a certain scene near the beginning involving Alice as working as a department store elf, and there are some hilarious bits involved with that, which gave me a sense of hope and entertained me no end as the book starts to get going. She after a challenge from her mum also ends up becoming involved in what is usually the disastrous village pantomime, and lets just say all of what she does with the panto, is not what you may expect from the Alice you meet at the start of the book. She really does grow as a character. Of course this wouldn't be a story, especially a Christmassy story, without a potential love interest, so in Luna Bay for a limited time, is a Hollywood actor, who takes a shine to Alice. But are things really going to be that simple, well of course not because otherwise it wouldn't be a good book! I was wowed by Alice's vision for Cinderella, and just wish I could have seen it myself, that, combined with her new friendships in Luna Bay, mainly the leading ladies of the previous installments, really turns her life around, which is a pleasure to see. I thoroughly enjoyed my third visit to Luna Bay, its a very pleasurable story, that is well written, in Lynsey James' typical way, nicely paced and easy and quick to read through, while being completely captivated by the story. 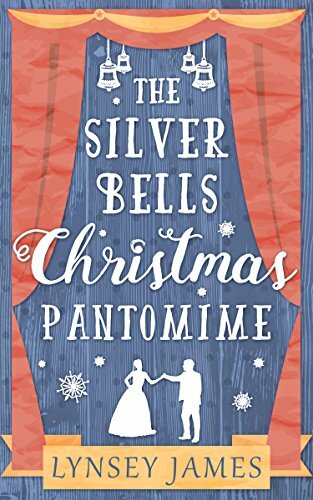 I really loved The Silver Bells Christmas Pantomime, and think its an excellent addition to this series. Thank you to HQ Digital and Netgalley for my copy of this book. This was my honest opinion. What a delightful and easy to read book, that is a lot of fun, and makes you really want to eat breakfast regardless of the time of day! In fact I really fancy some crispy bacon and pancakes to go alongside writing this review! This is the second book set in Luna Bay, but it can easily be read as standalone, featuring a new location within Luna Bay, and a brand new set of characters, as well as saying hello to old faces to pop up. It is always nice in a series, to see characters you recognise, and the second Lucy popped up, even though its been a long while since I read the first book, she was memorable instantly, I'm glad to say. But what of the new characters. Well Emily Reed suffers a really bad day. She lost out on the promotion she was chasing at work, and not on merit (or lack of), and the her critical and rather domineering mother drops a large bombshell. Emily's father of 25 years, is not her biological dad, and the other one lives in Luna Bay. Emily manages, sinces she is a workaholic to combine her insistence to get time off to go to Luna Bay, with a work trip to try and secure some big business in the area for her employers. She ends up at the Sunflower Cottage B&B and instantly lock horns with the owner's nephew. As her various quests get underway, things change when Rose who'se cottage it is, has a fall, leaving Emily and Noah to take over. Their first attempts at cooking breakfast are simply hilarious, although with my own cooking skills I probably shouldn't have laughed. What is equally amusing is that Emily doesn't do breakfast at all. She tends to just have a kale smoothie, so when they receive some expert help to try and improve things, and so they can offer a breakfast club for village of Luna Bay, she discovers just how tasty breakfasts can be. There is something just so readable about Lynsey James' writing, that is just a pleasure to read. It is easy to follow, flows well and the pacing is good too, all the while telling a story that draws you in and keeps you wanting to read more. The main themes of the book are to do with the shock announcement about Emily's biological father, her continued quest for promotion and also a lot generally of family relationships, in addition to whether she is going to follow her heart or head. I thoroughly enjoyed this story, there are lots of laughs to be had, and the overall idea of the Breakfast club really appealed to me. Thank you so much to Netgalley and HQ Digital for this copy of the book. This was my honest opinion. 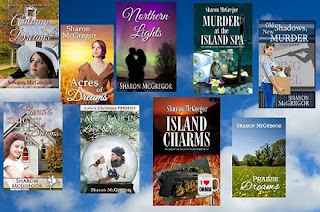 My guest today is Sharon McGregor, so let's find out all about her books. The first book I wrote was Island Charms, a cosy mystery, but the first one published was Northern Lights, a romantic suspense. I had been writing short stories for years, but I was between jobs, working part-time only, and I was looking for a project to take my mind off my lack of employment. Once I started, I was hooked. I write in two genres-romance novellas and cosy mysteries. The romances number five now-Northern Lights, Autumn Dreams, Acres of Dreams, Fiona's Knight of Dreams and a Christmas one, All's Fair In Love and Arson. So far, I have three cosies published-Island Charms, Murder At The Island Spa (second in the Island series), and Old Shadows, New Murder. Another mystery, Five Can Keep a Secret, is scheduled for the end of this year and two more completed books are slated for 2017 release-Murder Is Handy(second in the Boarding Kennel series) and Escape to Mulligan Lake. I am most proud of Island Charms because it was my first-born. I began writing it with doubts and anticipation. My experience to that time had been limited to short stories and I was flying by the seat of my pants-a scary thing for someone terrified of flying. I think Acres of Dreams was my favourite. It is a historical romance with beginnings in my own family history. My grandmother was born in Ireland in the 1880s, one of twelve children. At the age of 21, she was sent to Canada to live with a sister and find a husband. She met a cousin of sorts, married him, and they headed west to homestead on the Manitoba prairie. Other than its beginnings, the story is entirely fictional, but I felt a deep family connection as I wrote this story. I feel an attachment to Abby, the heroine of the Island series. She has reached that mature age where she is financially independent, single, and should be able to control her life-except for the odd dead body that turns up. Her children are grown and mainly self-sufficient. She is divorced but somehow unable to banish her ex from the edges of her life. Her romantic life is often in shambles as she strives to overcome her lack of self-assurance in her relationships with men. Through it all, her family and friends take precedence in her life. I think I would go back to Acres of Dreams, and cover a longer time period. I wrote the story quickly, with deep emotional attachment, almost in a stream of consciousness. I think if I could do it again, I would give a little more time to some of the secondary characters and allow Robert and Kate more time to settle into their new life. I may still do this, as I have at the back of my mind a sequel, following their family as it grows. I love the cover for Murder At The Island Spa, designed by Traci Markou. She captures beautifully the balance between objects that display the soothing rituals of the spa with the dagger, the frightening interloper that threatens that serenity. I've satisfied any itchy feet I might have by already writing in two genres-romance and cosy mystery. Switching from one to the other gives me new energy and satisfies any roaming tendencies I might have. I usually add suspense to my romances and try to insert humour into them both. Aside from the three completed mysteries scheduled for release over the next year, I am working on Number three in the Island series-Missing on Quadra Island, and Number three in the Boarding Kennel series, as yet without a title. I have always liked to work on two projects at a time. If my characters become obstinate or uncooperative in one work, I take a break from them and switch to the other for a time. When I am ready to face the difficult one, I usually discover time has allowed me to resolve the issues. I love the Kate Ellis Wesley Petersen series. They not only involve a present day mystery but an archaeological one as well. The series does follow a certain amount of personal change in the main characters but not in a way that dictates they be read in order. This series combines two of my favourite things-mystery and history. It's strange, but the thing that surprises me most is their number. When I began writing, it seemed to take forever to finish a work. At times, I felt my output must be about 50 words a day. Now I look back and see the numbers rising quickly for such a short time span, especially when I add in the books already completed and waiting for release. There are always black moments when I think I'll never be able to complete another story, but then I look back at the road behind to see how far I've come. Thank you so much Sharon for that fascinating interview. I'm so impressed that you can write in two genres, and you have some lovely book covers. 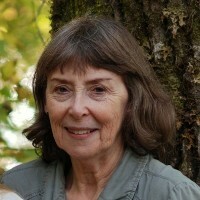 Sharon McGregor lives on the west coast of British Columbia on beautiful Vancouver Island.She worked her way west from the Canadian prairies to escape the cold and snow. Her imagination and story weaving got its start when she was an only child living on a farm. She’s moved on from cowgirl dreams to romance and mystery, but hasn’t lost her love for horses. When not writing or reading, she’s busy following the activities of her grandchildren, walking the dogs, and making travel plans. Holly Johansson knows some things in her life are certain after college graduation: 1.) It’s a long road to becoming a full-time author. 2.) She’ll need to work to pay her bills. 3.) And Dallas Demons superstar Matt Rhinelander will never return her feelings. Holly knows her unrequited crush on the partying hockey player is ridiculous. There’s no way Matt would be attracted to a woman who prefers watching TV or reading books when he’s known for his frequent bar hops and fast lifestyle. Obviously he would never see her as anything other than his teammate’s little sister. Yet Holly is drawn to the other side of Matt—the man she knows has always been thoughtful and easy to talk to whenever she’s been alone with him. It is this Matt that fueled the crush Holly has on him. And she knows it will always be just that—a secret crush. Because when Matt helps Holly through a crisis, her heart begins to believe that there might be feelings on his part, too. After a night of hard partying puts Matt in jeopardy with the Dallas Demons, can Holly be the one to save him? And when Matt admits he sees her as more than Nate Johansson’s sister, will it put them both on thin ice? One of the things I most look forward to, when starting a new book by Aven Ellis, is the knowledge that I will almost certainly end up with a book boyfriend from the story, as she writes the most loveable male characters. With On Thin Ice, I think it was a new record for me, I was in love with Matt Rhinelander before the end of chapter 3. Matt is another of the Dallas Demons ice hockey players, and fans of the series will have seen him mentioned a bit in previous books. If you are new to the Dallas Demons, then rest assured this is definitely a standalone story. For fans though, all your favourite Demons and their girlfriends are present in this story, some in a bigger way than others. Matt is just adorable, he manages to put Holly at her ease in an awkward situation, and seems to not mind any of her slight geekier behaviours. They are as different as chalk and cheese, but yet put them in a room together and they seem to bring out the best in each other. Holly is a quiet sort, happiest when working on her fantasy novel, and can't believe it when she is being encouraged to spend a bit more time with Matt, her long term crush, even if the circumstances and reasoning behind it are less than honest. This is after they spend a lot of time together on New Years Eve and the relationship between them begins to change right from the beginning. I have spent a joyous couple of hours reading On The Ice, its a simply wonderful romance that you know what the overall outcome will most likely be, and as a result you can just relax and read the lovely journey that is discovering just how these two people with get to their HEA. 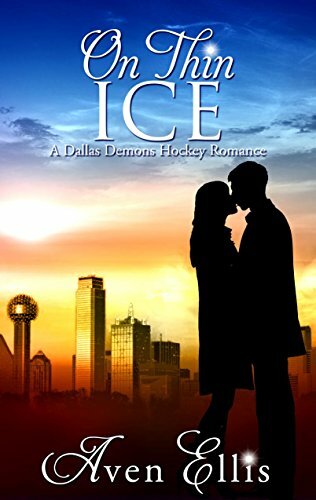 Filled with witty banter, a love of socks, a sugar kitty, a social anxiety disorder, a love of planners, very easy to read writing and a romance between two people that is a joy to read about, On The Ice is another winning Dallas Demons book from Aven Ellis. Thank you so much to Aven Ellis for this copy of the book that I have reviewed voluntarily and honestly. Snow is falling and Christmas day is in full swing at Hannah Meadows’s rural home. But the usual preparations for a turkey dinner with all the trimmings and lashings of festive booze are interrupted by an unexpected knock at the door. And there on the doorstep they find a handsome stranger with no memory of who he is or how he came to be there, begging for their help. So begins a winter like no other – one that turns all their lives upside down. For Hannah and her sister Gina, the stranger’s arrival might herald the prospect of love and healing for the hurt caused by messy break-ups. For Jess, Gina’s teenaged daughter, however, it signals dark times and discontent. There are new friends and enemies for them all and a new outlook on the world – and when the stranger’s memories finally return, there is heartache too. 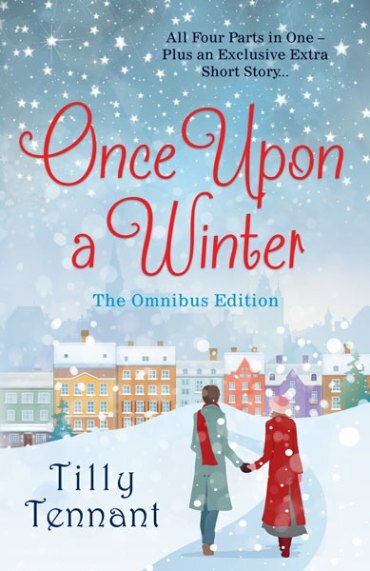 Once Upon A Winter is the combined novel of the four previously released parts, plus a brand new extra part just for this omnibus edition. If you had considered reading each part separately rest assured they would all work as little standalone novellas that are best to be read in order. I chose to read it as the full omnibus and I'm glad that I did, as it felt like a full book this way, which just happened to have its parts named! I loved this book, it is the story of sisters Gina and Hannah, and Gina's teenage daughter Jess, following their winter, starting with a most unusual Christmas day. Quite early into the story, this had me thinking, as what would you do if you lived in a remote area, and a stranger turns up on your doorstep on Christmas Day, in the snow, clearly injured and also apparently suffering from amnesia. As this is what sets into action a whole chain of coincidences and new romances. There is a great case of character's and some of Hannah's neighbours are fantastic. It takes a while for me to warm to the stranger on the doorstep, but soon I was interested in his life, and there is a couple of fantastic and gripping storylines that he is involved in. Ross and his family are a delight to read about they all seem to be genuinely nice people, which is something that hasn't escaped Gina's attention. Each part has its own little main story arcs, while progressing the main story along well. The whole book is easy to read, and I loved the location of the village just outside Millrise. Millrise has of course featured in many of Tilly Tennant's books. I think I loved the first part the best, followed by the added extra section for this edition, which gave a good rounding off of the characters lives, and gave me a good sense of closure, and had me smiling a lot. At some point in the middle, I did feel like the story was dragging slightly, possibly just because it was complicated and not explained as well as perhaps it could have been. Really did enjoy the majority of the story though, and was surprised with some of the twists along the way. Gina's ex husband is a nasty piece of work, as is another partner that features. Definitely a couple of baddies in with all the goodness and warmth of the story. Once Upon a Winter is the sort of book that could keep you cool on a hot summers day, or if read in winter will provide a good backdrop and alternative to the outside world! Thank you to Lawsome Books and Netgalley for my copy of the book. This is my honest opinion. Charming second novella in the Cedarwood lodge series, which progresses the action on nicely from the first book, while setting up the final book for what I'm hoping to be a spectacular conclusion. The central points of this novella are the Wedding Expo to try and get lots of new brides to book in for weddings in the New Year. However what should be rather simple is filled with unexpected problems that need to be solving, and which lead to a certain male outdoors type to but in a return to the Lodge. The other main story is Clio's best friend, Armory and her relationship with Cruz. In fact there are quite a few romances brewing at Cedarwood Lodge, and they are all enjoyable to read about. What I am still most intrigued about is Clio's relationship with her mother, and frustratingly we still don't know what the big secret is, although there are some hints, so I can look forward to a wait to try and work it out, while waiting for the next book. This definitely works as a second book in a series, but I am not the best person to judge if it would work as a standalone, but since each of these are relatively short, it would be a shame not to read Celebrations & Confetti at Cedarwood Lodge first. 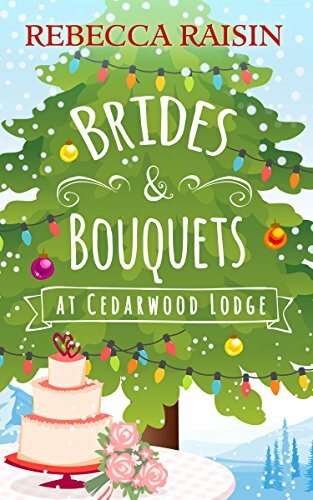 Brides and Bouquets At Cedarwood Lodge is another enjoyable installment of this series, and I am now starting to get a proper feel for the characters. Thank you to HQ Digital and Netgalley for this copy of the book that I have reviewed voluntarily and honestly. It's the perfect season to fall in love. Amber Raey is working all the hours God sends as assistant to one of the country's top fashion designers, and her boss is a complete nightmare. But Amber has big plans for her future so, for the time being, she just has to grin and bear it. And then opportunity comes knocking and suddenly she's on the fast track to the top. Amber adores her new life, especially as she's falling in love for the first time too. But soon the glossy exterior starts to slip and Amber begins to wonder if she's made the right decision entering this world. Then a face from her past reappears and she finds herself in real trouble. With Christmas fast approaching, Amber is drifting further away from her loved ones. Can she get her life back on track before it's too late for a merry Christmas? 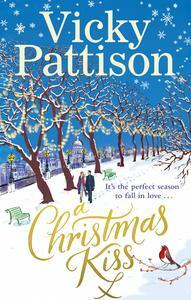 Despite the fact this book really does contain a Christmas Kiss, the Christmas bit of the book is very small and right at the end, so I really would't worry about the title and you can easily read this book at any time of the year and enjoy it. In fact it is a very enjoyable and entertaining story, focusing around the fashion industry and about what happens when you start to get a bit of press interest. These are clearly subjects that the author is going to know a lot about, and it does show in the way the story comes across. This is an easy to read book that seemed quite inconsistent in places. There is a storyline all to do with Amber's family that should be more emotional than it comes across, but yet elsewhere its all shine and little depth. The story is easy to follow and is split into four distinct parts, as the timeline of the progresses there really are four separate stages to Amber's journey. There are two major love interests in the book, the one you are rooting for the whole way through, and the other which I was enjoying to start with, but within one relationship, Amber soon learnt just who she can count on. What really did surprise is that for a book featuring an aspiring fashion designer, and some models, there was very little details of what designs Amber is working on, so by the time there are fashion shows roll around, its hard to feel empathy with Amber's neves, as I really couldn't picture anything that was going to be featured on the catwalks. There were two cameos in this story, one that I loved, and the other that I have really mixed feelings about. The first was Issy Jones, who appears briefly behind the scenes, she featured in Vicky Pattison's first book, and it was great to just get a quick catch up as to what is now happening in her life. The other cameo is of the author herself, and I can't work out if I am just annoyed that the blatant publicity for her own brand, or amused that she would include herself as a character. I suspect that fans of Vicky Pattison will love it. There are laughs to be had definitely in this light hearted story that will definitely appeal to a certain audience, I just don't fully believe it was me. I did enjoy the book, but not as much as All That Glitters which is a shame. Thank you so much to Netgalley and Little Brown Book Group for this copy of the book. I read and reviewed it voluntarily, and this is my honest opinion. Just who is the real Milla Graham? Is she the 6 year old girl who died in a tragic fire 18 years ago, which wiped out most of her family? Is she the 24 year old girl who has just been found murdered, back in the house that is now derelict from the family? Is she the girl who is definitely alive and kicking, claiming to be Milla, who has run into DI Ben Taylor in odd circumstances and now their paths keep crossing? Only one thing about this one, she claims she lies a lot, so what can you really trust that she says. Those were the questions on my lips as I started to unravel the truth in this intriguing and utterly unputdownable story. I was so absorbed in what I was reading, that I haven no idea what happened with half of my commute home tonight, as I didn't notice anything other than finding out just what was a lie, and just who Milla Graham is! I thought I would be confused or annoyed with a character that we know likes lieing, but in a way I found it more fun to just take everything at face value until proven otherwise. This way I could be surprised at regular intervals while my brain was processing everything else that was going on to try and see if I could come to any conclusions ahead of the book. All the girl claiming to be Milla that is alive, wants is to discover just who it was that killed her mother all those years ago, and ideally exact revenge. As she slowly meets people that were around on that fateful day, we are introduced to all sorts of characters...and she keeps bumping into Ben too while he investigates a murder. This is the first time I have read a book by Louise Marley, and if this is her general standard of writing, then I am clearly missing out on a gem, and will need to rectify that in the future. I was so impressed by how fast the book drew me in, and had me wondering about various things. In fact I even had trouble sleeping the night after I first started the book. 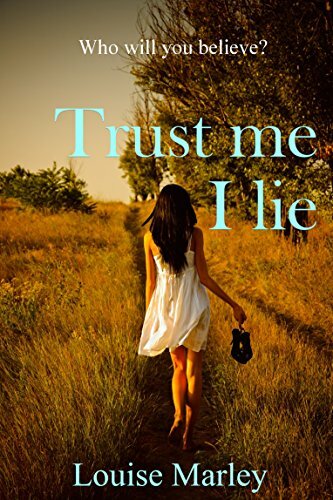 Trust Me I Lie, is part mystery, part romantic comedy (yes there are some funny bits), some violence but not gruesome and generally and all around fantastic book. It is easy to read, reasonably quick paced and gets your mind continually thinking about the the story, even when you are no longer reading it. I loved it! Thank you to Louise Marley for this copy of the book which I have reviewed honestly and voluntarily. The last thing Harriet Westmoreland wants is Christmas away from home, particularly when skiing, snow, heights and freezing her backside off are on the menu. While her own family, together with her best friend Grace's, are soon whizzing down ridiculously high and scary mountains in the fashionable Italian resort of Cortina d'Ampezzo, Harriet is stuck in the remedial class on the nursery slopes unable, it seems, to remain vertical. I have just spent a couple of pleasurable if slightly befuddling hours reading this lovely novella set against the backdrop of the Italian Alps. I was taken slightly by surprise, as I didn't quite realise until I started that this is the next book in Julie Houston's series, featuring the Westmoreland family, and all of their increasingly complicated relations. I think that if you haven't read any of the previous books you may be slightly confused too by just who is related to who, and why, and since it has been a while since I read them, it took me a while to get it all straight in my head again. Regardless once I got into the book which starts with a hilarious opening chapter, I soon was really enjoying the story that was being told. Harriet is scared of heights, doesn't like the cold and can't ski, in fact it soon becomes a case of can't ski - won't ski! Yet she and the rest of her family, all five of them, plus her best friend Grace, her family, and also Amanda's family are all heading off for a skiing holiday in the period between Christmas and New Years. There are so many light hearted amusing scenes that will really resonate initially with anyone that has flown with a budget airline, and then later on the attempts in getting Harriet to ski are also amusing. However its once Harriet gives up and goes off exploring that the whole focus of the story changes in quite a surprising way, and adds a whole new dynamic to the book which makes a good story even more impressive. There are some wonderful descriptions of the food being produced in the chalet that my mouth was really watering for, and with children of various ages being present on the trip, there were all sorts of amusing interactions, including with the teenagers who is getting together with who, and the pre-teen commentary on the situation. 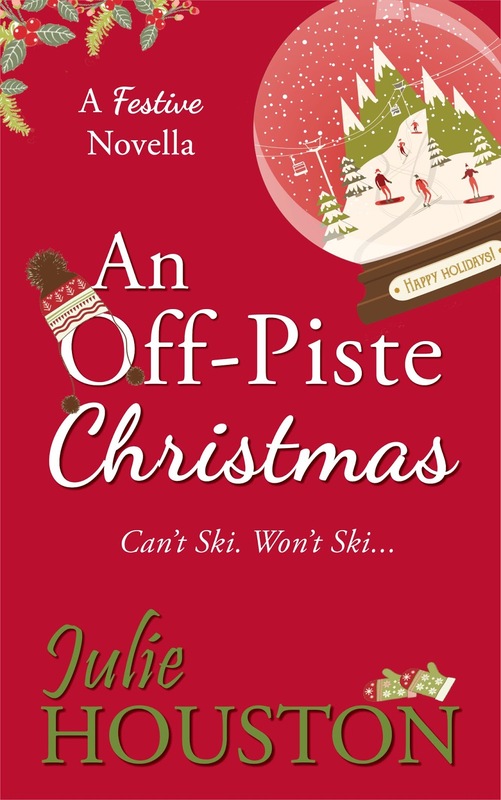 All in all, once I got my head around the characters, I found An Off-Piste Christmas, to be a fun look at an extended family holiday in Cortina, complete with the sheer contrasts with the richest and slightly more regular members of the party! Thank you so much to Julie Houston for this review copy of the book. This was my honest opinion. Ruby has finished with university and is heading home for the holidays to save up for her trip around the world in January. Against her father’s wishes, she takes on a stall at the local market, and sets about making it the best Christmas market stall ever. There’ll be bunting and mistletoe and maybe even a bit of mulled wine. But with a new retail park just opened on their doorstep, the market is under threat. So together with all the other stallholders, Ruby devises a plan to make sure that Wynbridge is the first port of call for everyone’s Christmas shopping needs. I am so disappointed that this book had to finish, I was enjoying it that much. It was such a pleasure to return to Wynbridge, to catch up with old friends from previous books, as well as being completely absorbed in this new story. If you haven't read any of Heidi Swain's previous books, besides the fact you are missing out, it may please you to know that they all works as stand alones and this no exception. It features completely new characters, new families and a whole new focus, while also allowing you to see what is currently going on with residents of the town that have featured in previous books. The writing is vivid and paints a brilliant picture of the story, and I could see the market square very clearly, along with all the other stall holders. I loved what Ruby was selling on her stall, and she is a breath of fresh air, in her return to the town, not that she is planning on staying long. Ruby's market stall is opposite her ex-boyfriend's so they are in close contact a lot, but just how over each other are they really? I was undecided for a bit of the book as to what would happen between the pair of them, but that wasn't the storyline that really had me guessing. That goes to just what exactly Ruby's dad is up to, as he really isn't acting himself, and no matter what Ruby does, she seems to be in his bad books. As more information about her dad is unveiled, I kept gasping, asI really couldn't believe the turns the story was taking, and had to keep reading to find out more! This was a story that was full of the joys of not only Christmas, but also of a struggle to revitalise a market and the holiday in the town, where most custom is going to the new out of town retail park. I love a book where a community bands together for a common goal, and really liked the ideas Ruby was suggesting to bring a bit of oomph back into the old tired and tested town Christmas traditions. Lizzie and Jemma from the Cherry Tree Cafe, are the ones providing the wares for the market stall, and I loved the descriptions of the various crafts on sale, and the bakes that Jemma kept making, made me very hungry and in need of a sugar fix. 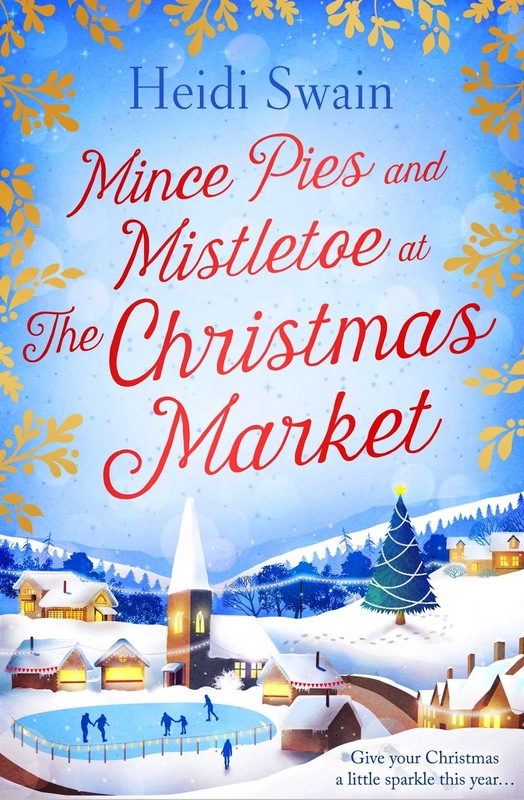 I loved every moment of Mince Pies and Mistletoe at the Christmas Market, and with every book, I am more and more convinced that Heidi Swain is becoming a drop everything and just read the new book author for me. I am so enjoying her books, and this was a top addition to her catalogue. A wonderful, heartwarming and funny Christmas novel from Chrissie Manby, perfect for curling up with in front of the fire. What could be more magical at Christmas than a fairy tale come true? It's the festive season and the members of the Newbay Theatre Society, more commonly known as the NEWTS, are preparing to put on a show. Being cast as Cinderella is the realization of a dream for newcomer Kirsty, not least because she hopes starring in a panto under the direction of her boyfriend Jon will bring them closer together. But Kirsty soon learns that it's not all glitter and good cheer behind the scenes at the amateur theatre as bitter rivalries nurtured through decades, wardrobe mishaps and suspicious near-fatal accidents threaten to derail the production. And then there's Prince Charming himself. Will working together with Jon bring Kirsty her happy ever after... or reveal their love to be nothing but a 'showmance'? With Christmas just around the corner, it's going to take more than a Fairy Godmother to get Kirsty and her cast-mates to the ball. I am a sucker for a pantomime, and have a real soft spot for Cinderella. I half wish I could borrow some children to watch the new massive production at the Palladium, but that would be weird, and clearly I need to get back to the a point! The NEWTS are putting on Cinderella this year, and guess who is playing the lead? It's only Kirsty who Chrissie Manby fans may remember from A Proper Family Adventure, as she was also onboard the ship the Benson family were on. She has followed boyfriend Jon, to Newbay, in order to star in the am-dram panto that Jon has written and directed. What can I say about Jon? Well he really is the baddie of the piece. He seems overly critical of Kirsty continually, and seemed to have running digs about the size of her feet and her weight, running continually. To the extent that I swear that if I heard him say its "fast day" to Kirsty one more time, I wanted to travel to Newbay to whack him over and over with a hard crusty baguette, the sort that he wouldn't let Kirsty eat. Then there is the most heartwarming storyline of the book which involves Ben and Thea. Seeing how Thea comes out of herself after she meets Kirsty and decides to audition to be in the chorus is a joy to behold, and does wonders for showing how drama can improve a child's confidence. At the start of the book she feels a bit lanky and not sure of her own body, with not fabulous co-ordination, she doesn't really have any friends, and then she becomes a mouse and everything changes. The whole book focuses around the auditions and subsequent production of Cinderella, and we get to know the whole cast incredibly well. I loved the mix of personalities in the show's company, and seeing how some of them are just like the roles they have been cast in. I loved the glimpses we got of the twins playing the ugly stepsisters, and it sounds as though they had the just the right level of knee-slapping humour and risque ad-libs. I found the whole book flowed really well, and I can't believe that this is Chrissie Manby's 20th book already, as it means I am a lot older than I thought, having read all of her books. 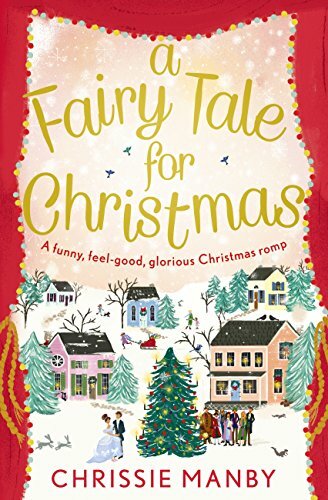 This is another shining example of a book that is a joy to read from Chrissie, its not overtly festive but has all the trimmings of the season, while focusing on the panto's run, rather than Christmas Day itself. With some interesting sub plots, a very enjoyable set of main storylines, two focal points both of which provide plenty of entertainment, this is a story that will conjure up memories of your own trips to the local panto, making you want to scream out all those classic lines including "oh no he isn't" and "it's behind you" while seeing just what the whole cast really get up to behind the scenes.